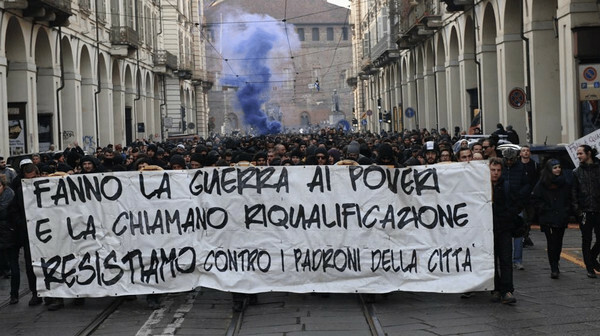 Summary of the recent repressive operation in Italy in connection with the resistance against the Italian migration regime. 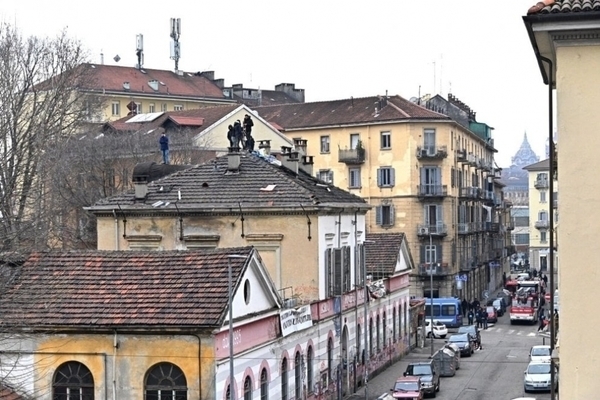 On Thursday 7 February 2019, at 4:40 a.m., the eviction of the squat Asilo Occupato in Via Alessandria 12 in Turin, occupied since 1995, began. The eviction was carried out as part of the Operazione Scintilla (Operation Spark). Several hundred Carabinieri in riot gear, police officers and Guardia di finanza with machine guns and plain clothes police not only evicted the house, but also arrested six anarchists. A seventh person is still being searched for. The charges are serious: formation of a subversive association, incitement to crime and the possession, manufacture and transportation of explosives in a public place. The charges are related to the resistance against the Italian migration regime, namely against the deportation camps/prisons CPR and CIE (Centro per l’Immigrazione e il Rimpatrio, Immigration and Repatriation Centre: Centro di identificazione ed espulsione, Identification and Deportation Centre). 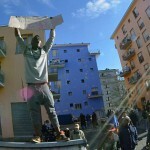 Thursday February 7, early in the morning, the cops with the help of the fire brigade, stormed the Asilo Occupato, a place that has been occupied since 1995 and been scene of organisation of social struggles (against evictions, against prisons for migrants, still a few years ago against the TAV…). 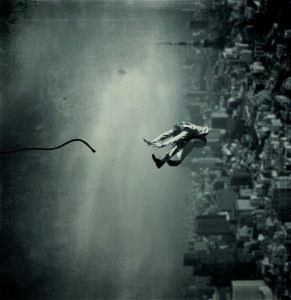 People climbed on to the roof, where they remained for over 24 hours. In the end, the cops managed to get everyone out and condemn the building. Same thing for Le Serrande, the occupation of Corso Giulio Cesare. Several solidarity gatherings took place in the neighbourhood, which had been completely cordoned off by the cops. Apparently some people have been arrested for resistance or violence against the blues. The evening rally to discuss the situation at Radio Blackout turned into a wild demonstration. 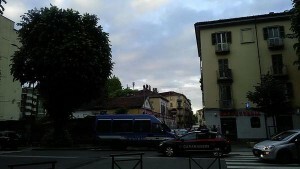 A massive repressive operation took place on Friday 13 in Turin. 15 precautionary measures were notified at dawn, against university students, antieviction and notav struggles’ militants: 9 of them were put under house arrests. The social centre Askatasuna and the people’s space Neruda were raided, too. The operation is linked to Mayday 2017, when amongst the general bewilderment the police charged in order to prevent the social bloc from entering the demonstration’s conclusive square, out of fear of protests against confederal trade unions and the Democratic Party. A court of review hearing, held to decide over Kam, Fran, Antonio, Beppe and Lorenzo ended a few hours ago. The charges that led the five comrades behind bars and banned Monica and Michela from the city were discussed, in order to decide if the measures imposed before the trial were to be modified. Even if the hearing was held behind closed doors we learned that a large assortment of cops was in the courtroom: plain clothes officers from Porta Palazzo police station, Digos officers, screws, [prosecutors] Padalino’s and Rinaudo’s bodyguards and a bunch of carabinieri. They were all there to highlight the power that they hold in a courtroom. Power transferred through court papers and the reconstruction of that night’s events, like the events of many other nights, days and moments spent in a corner of some police station or in the streets during a police check. Anything that happens before and after, the cause and the effect, are mixed up to create a tale that is more effective on paper, the assessment of the charges and the weight of the sentence. At 6:30am on 3rd May antiriot police and carabinieri squads coordinated by Digos and ROS, stormed Asilo Occupato, the squats on Corso Giulio Cesare and Borgo Dora and two houses in Turin and Barge; the local media also mentioned raids carried out in Bologna and Cuneo, of which we have no confirmation. The pretext for this repressive operation, which led to six comrades being arrested, is an alleged scuffle that took place outside Asilo last February at the end of a night event; the charges are kidnapping, aggravated damage and resisting public officials. Antonio from Lecce, Antonio Sardo, Camille, Fabiola, Fran and Giada were taken to the prison of Le Vallette, and there’s mention of an unconfirmed seventh arrest. 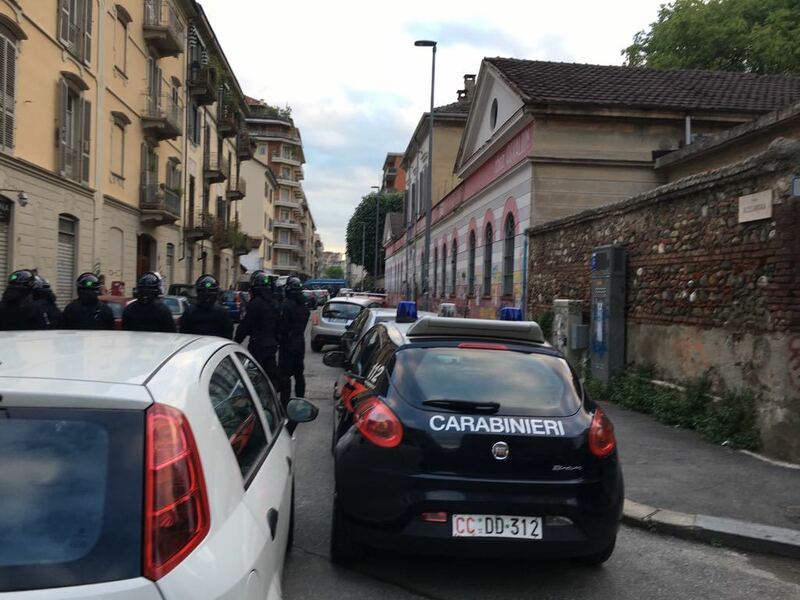 Heavily armed officers from the General Investigations and Special Operations Division of Italy (Digos) broke down the front door and invaded the Asilo Occupato (occupied asylum) building in Turin on Wednesday, arresting six activists. Occupants of the anarchist-run space, located on Via Allesandria, in the neighbourhood of Aurora, resisted for several hours on the roof of the property before the raid. Carabinieri (Italian militarised police) also participated in the repressive operation. 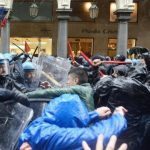 The arrests are related to a clash with carabinieri guards that took place on February 28th in the vicinity of Asilo. Agents alleged obstruction and damage to a police vehicle as they prepared to carry out the identification of a “suspect” but were stymied by the arrival of 15 people who blocked them from doing so. On the night of October 23rd two loud explosions have shaken the neighborhood of Lingotto, Turin, Italy. Bombs and firecrackers were placed in one of the building of Ex-MOI, the former Olympic Village, occupied since 2013 by migrants and refugees. It was likely a revenge by football ultras against some migrants they had a fight with. Unfortunately these migrants live among many other, currently 1200. Hearing the explosions many escaped from the building and spread in the nearby streets. 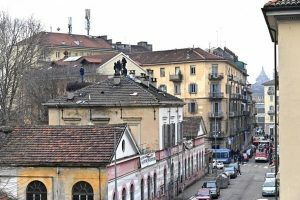 The story of ExMoi begins with two open wounds: the countless empty buildings in Turin, and the countless refugees living on Italian streets and in Italian train stations. Back in 2006, the Turin municipality and the national government spent over 140 million euros in building a new neighbourhood to host athletes for the Winter Olympic Games. This was in an area that once held the city’s biggest wholesale market (MOI – Mercato Ortofrutticolo all’Ingrosso). Designed by international architects and built according to the latest ecological and sustainable design criteria, the Olympic Village was finished in 20 months. It was used for around 16 days and left mostly empty after the Games ended. 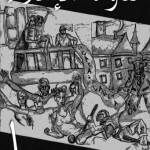 In December 2012, a zine was released on the subject of the struggle against the sfratti in Torino. Lutte contre les sfratti à Turin (English translation in the works). At large, this booklet was a compilation of texts, consisting as much subjective stories (allowing to understand the practices put at play) than more theorical reflexions on the perspectives of this ongoing struggle. Waiting for news, we communicate that, around 6am of the morning, the Digos [political police] has searched many occupations (Asilo, Barocchio, Mezcal, Askatasuna) and houses, arresting three people, notifying some house arrests (it seems they’re four people) and to others, the requirement to sign in at the local police station. The repressive operation it’s a revenge for the riots occurred on the eviction of L’Ostile [last december], the restricted measures are emaned by PM Rinaudo. There’s a public assembly today afternoon at Mezcal squat to organize future iniziatives.